If you have just started a career as a freelancer, you will soon discover that the online sites, such as UpWork, require from you to submit a proposal for a specific job. The bidding process is very competitive, and the best written offer is not always guarantee that you will get the job. The other freelancers competing for the same job under the same conditions that are equal for all, and usually the provider with the most attractive proposal gets a job. What is the business proposal? Business proposal is a document that is intended to potential clients in order to get a particular job. It is a very specific summary of the reasons why you are qualified for the job you are applying for. The proposals are something more than a friendly greeting to potential customers and expressions of interest for a particular job. It is an opportunity to specify your qualifications and experience that will allow you to do the job perfectly, accurately and on time. As for the details in proposal, it is important to mention the cost of your work (expressed in dollars or another currency) and how much time would you need to do the job. 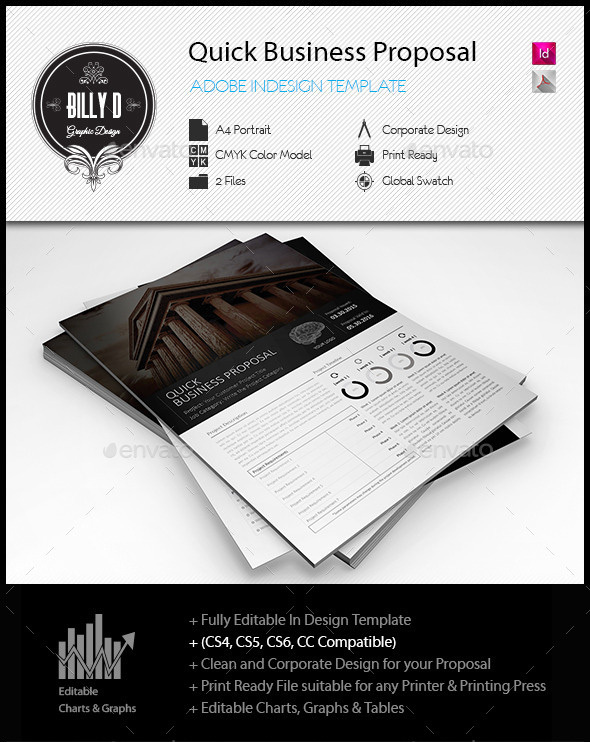 This is handcrafted flat & modern business proposal template made in InDesign to make your creative project easier. It comes in 2 sizes: A4 and US Letter, it contains 22 pages which are easily to editd print ready. Preview and download here. This is document in A4 Size + US Letter Size print dimension with Bleed + Trim Mark, Well Layered Organised InDesign CS3, 2 color version, 22 Pages Print ready & Fully Editable, Text/fonts/colors editable, CMYK ,Very Easy to Customise & replace the model image. Fonts & Image html links inside in help file. Preview and download here. 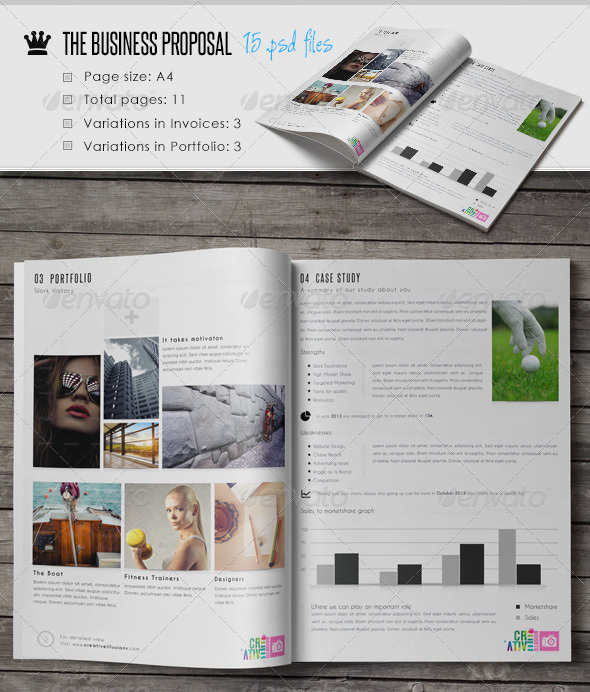 This is 14 pages business proposal template in A4 & US Letter size, print ready, made in InDesign and Word. It’s very modern and clean. Easy customizable. Preview and download here. 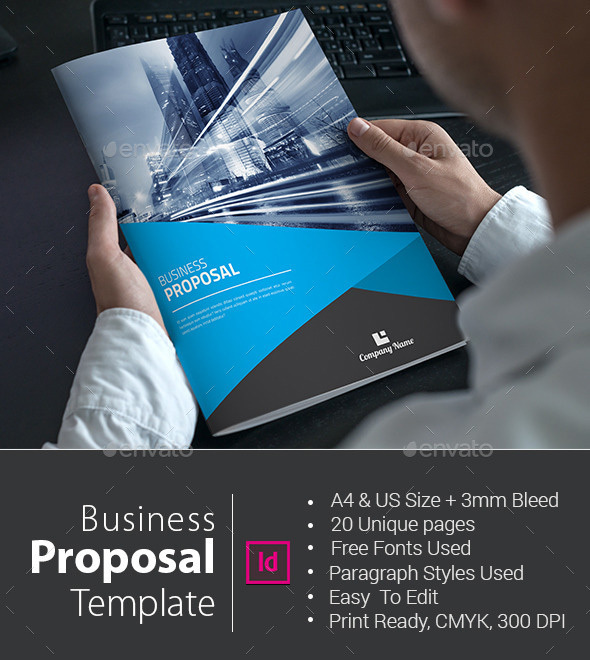 Organize your business proposal quickly with this great template. It’s fully editable in InDesign, clean and corporate design, print ready, it contains charts, graphs and tables. 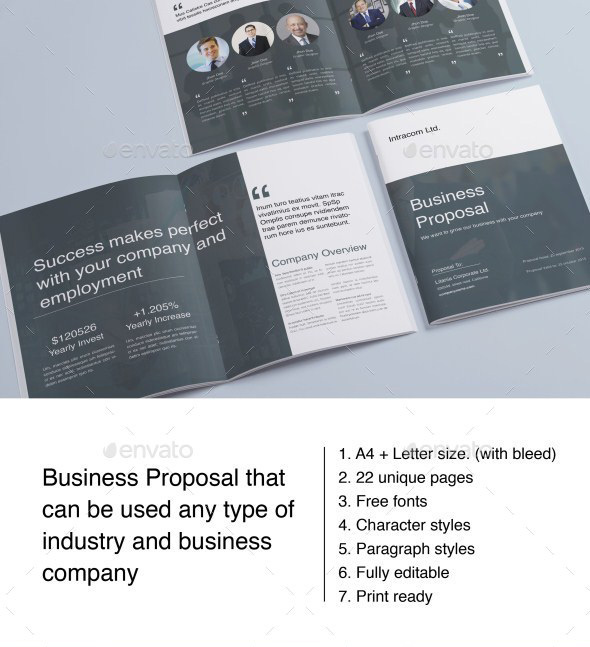 You will certainly impress your customers with this business proposal template. Preview and download here. DETAILS: 16 Pages (A4 & US Letter). Paragraph Styles. Automatic Page Number. Easy to Customize. Free Font Used. Print Ready With Bleed. Download here. 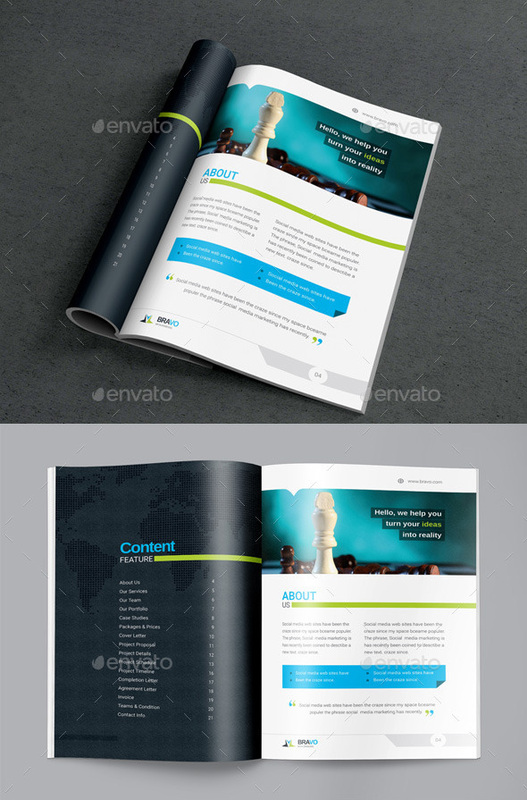 Professional & Corporate InDesign proposal template that can be used for any type of industry. The clean and clear layout and free font type will help you enhance your message in a way that will captivate the reader! Everything is editable in InDesign. Just add your own pictures and texts, and it’s ready for print. All colors can easily be changed. All texts are set with free font, and download link are provided. Preview and download here. This is a 20 page In-design “Business Proposal Template” for company that needs clean, professional, modern template design. Preview and download here. A modern, elegant and stylish Proposal template. Show your business to your potentials clients in a clean and elegant way. Ideal for business, personal and corporate use. Easy to Edit colors, modify shapes, texts etc. Download here. The product has been designed to fulfil all your requirements from a proposal, while maintaining a clean & Elegant look. Sizes: A4 (8.5 * 11.9 with bleeds). 15 .PSD Files, Complete business proposal, 11 different pages. 3 variations in Portfolio page. 3 variations in Invoices page. Help file included. QR code generator link. Preview and download here. This is a Business Proposal template will made in InDesign CS4 & MS Word 2010, The file is completely editable, all of the fonts used are free and downloadable. Features: A4 page size (with bleed 3mm). US Letter (with bleed 0.125”). CMYK @ 300 DPI – Print-ready. Easy to edit and change colors. Download here.